Being successful means adopting step-by-step development and change as a constant. By decision of the National Assembly of the Republic of Bulgaria of May 21 2015, published in the State Gazette #38 on May 26 2015, International University College – Albena (IUC) has been transformed/ converted into Varna University of Management (VUM). DECISION 3558 (State Gazette, page 7). In April 1998, International University College (now Varna University of Management) was granted initial institutional accreditation by the Accreditation Council of the National Agency of Evaluation and Accreditation. The establishment of the new higher education institution was subsequently approved by an ordinance of the Council of Ministers of the Republic of Bulgaria of August 23 1998. International University College – Albena (now Varna University of Management) was established under an act of the Bulgarian Parliament of May 5 1999 (published in State Gazette 44/1999). VUM is officially accredited by the Bulgarian Ministry of Education, see number 13 in the listings, as well as by the British Accreditation Council (BAC), established in 1984, (you can see the certificate here). 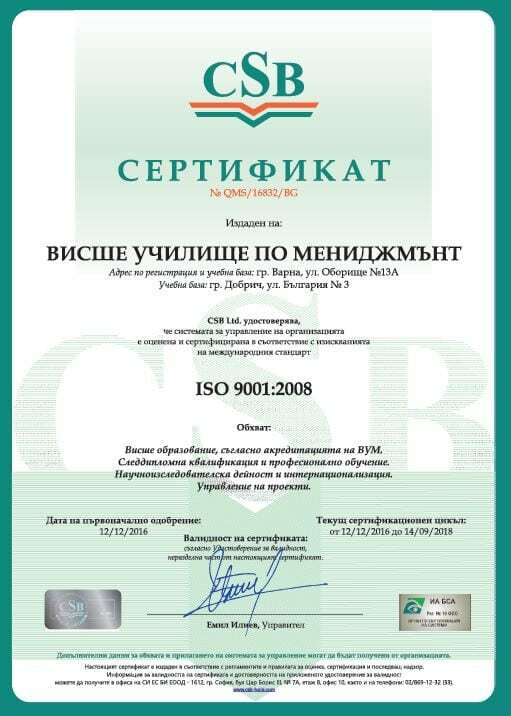 The Management System of VUM is evaluated and certified in accordance with the requirements of International Standard ISO 9001:2008, (you can see the certificate here).